The Trapani House Plan is an award-winning two-story Mediterranean design. Varying roof planes of colorful tile surfaces, precast rope columns, and large picture windows make a dramatic first impression as well as showcase waterfront views. 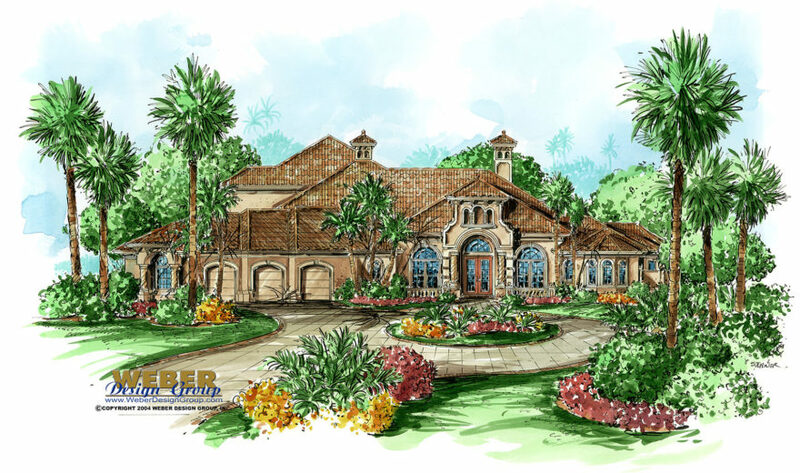 This luxury home plan overflows with character and Tuscan detail, from the creative ceiling designs to the multiple walls of shimmering glass. Space for formal entertaining is shared between the dining room and the elegant living room, accented by the zero corner sliding glass doors, and the casual wet bar with tray ceiling. The living room is impressive with its centered fireplace and built-in shelving. Down the hall, on either side of the built-in art niche, you will find two oversized bedrooms with their own private baths. A step saving kitchen works well with the cozy dinette and its beautiful section of mitered glass, or the enormous family room with warming fireplace and built-in entertainment center. From the family room, living room, or the master suite, open your expansive double pocket sliding glass doors to access the expansive lanai and pool area. Take full advantage of the charming gazebo with outdoor kitchen, when entertaining friends poolside. Just past the study, you will find the elegant master suite, with double door entry, high ceilings, and intimate sitting area. Separated by a pocket door are the exercise room and master bath. The exercise room comes equipped with its own wet bar, and large fixed glass window to make use of all the natural light. In the master bath you will find his-and-her walk-in closets, sit down vanity, whirlpool tub, and oversize walk-in shower with glass block and mitered glass to view your private outdoor garden. 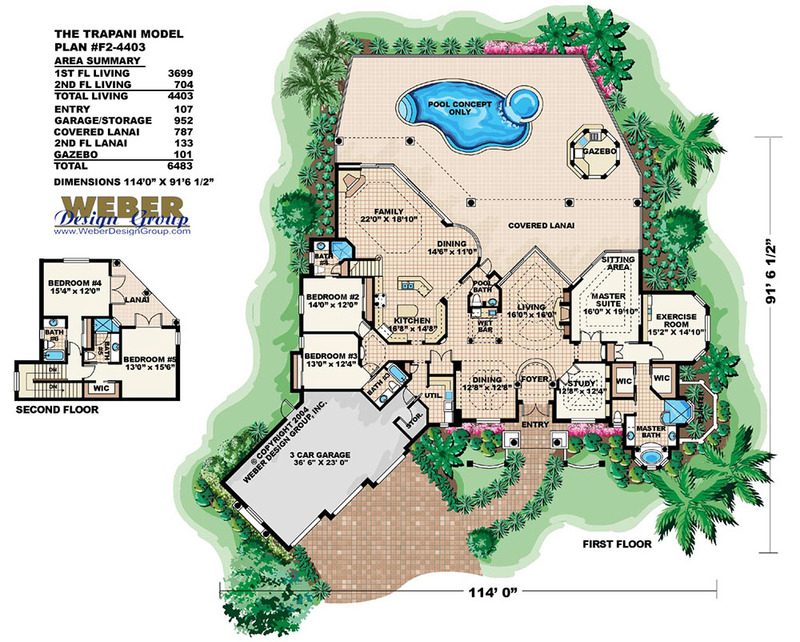 Upstairs bedrooms 4 and 5 complete this house plan. Each bedroom has its own bath and a splendid view of the pool and spa area from the covered lanai.